The modifier tuberous refers to the nodular character of this type of xanthoma. Typically, they appear on the elbows, knees, and buttocks, and less commonly, in other areas. The tuberous xanthoma spectrum encompasses tuberoeruptive xanthomas and tuberous xanthomas. Tuberoeruptive xanthomas are dermal papules with an inflammatory component, while tuberous xanthomas are larger, non-inflammatory lesions that can extend beyond the dermis to the subcutaneous tissues. Tuberoeruptive xanthomas have been described to coalesce into tuberous nodules. Though not pathognomonic for any specific hyperlipoproteinemia, tuberous and tuberoeruptive xanthomas are most commonly associated with familial dysbetalipoproteinemia, type III. In this disorder tuberoeruptive xanthomas develop on the elbows. When seen in conjunction with palmar crease xanthomas (xanthoma striatum palmare) the diagnosis of familial dysbetalipoproteinemia, type III is virtually assured. Other conditions associated with tuberous xanthomas include familial homozygous hypercholesterolemia, cerebrotendinous xanthomatosis, and b-sitosterolemia. In patients with homozygous familial hypercholesterolemia, tuberous xanthomas accompany the pathognomonic intertriginous xanthomas. In cerebrotendinous xanthomatosis, patients will have a constellation of symptoms including: tuberous and tendon xanthomas, neurologic dysfunction, and cataracts. Tuberous xanthomas are characterized as subcutaneous nodules on the extensor surfaces of the elbows, knees, knuckles, and buttocks (Figure 1, Figure 2). The patient with tuberous xanthomas should have a fasting lipid profile performed. In dysbetalipoproteinemia the most common abnormality will be the elevation total cholesterol and triglycerides, which are equally raised. The diagnosis of dysbetalipoproteinemia can be confirmed by the identification of the mutant apolipoprotien-E2 allele. In familial homozygous hypercholesterolemia patients will have characteristically high LDL levels, with elevations at times near 1,000 mg/dl. Patients with cerebrotendinous xanthomatosis and b-sitosterolemia will have elevated levels of total cholesterol as well. Additionally, patients with beta-sitosterolemia will have elevations of sitosterols (plant sterols). Two-thirds of patients with dysbetalipoproteinemia will have tuberous or tuberoeruptive xanthomas. Interestingly, the homozygous apolipoprotien-E2 state occurs more commonly in the population (1/100 persons) than the clinical syndrome of familial dysbetalipoproteinemia (1/10,000 persons). The clinical phenotype is unmasked when patients develop an additional abnormality characterized by overproduction of VLDL such as diabetes mellitus, obesity, or hypothyroidism. Other entities associated with tuberous xanthomas include familial homozygous hypercholesterolemia, b-sitosterolemia, and cerebrotendinous xanthomatosis. All of these conditions are rare. Starting with the exogenous pathway for lipoprotein metabolism, dietary lipids enter the circulation in the form of chylomicrons particles. They travel through the capillary system where capillary lipoprotein lipase recognizes the class C apolipoproteins (apo-C) present on the chylomicron and exerts its hydrolytic action on the triglycerides present. Progressive hydrolysis of triglycerides causes a reduction in the size of the chylomicron and loss of other surface components including apo-C, resulting in a chylomicron remnant. The presence of apolipoprotein E traffics the chylomicron remnant to the liver to participate in the next steps of lipid metabolism. In the liver very low density lipoprotein (VLDL) molecules are produced. They are triglyceride-rich particles that contain relatively more cholesterol than in the chylomicron. The VLDL molecule contains the apoliprotein-100 molecule as its predominant apolipoprotein. Like the chylomicron, once the VLDL leaves the liver it travels through the peripheral circulation where lipoprotein lipase acts on its triglyceride elements. As triglyceride is removed from the VLDL a residual particle, the VLDL remnant, is formed and it continues to travel through the circulation. VLDL remnants are removed from the circulation by the interaction of apolipoprotein-E, and apo-100 with receptors on hepatocytes. Upon recognition of the apolipoproteins by receptors on hepatocytes, the VLDL remnant is internalized. Many of the VLDL molecules are degraded within hepatocytes to their constituent lipids; however, a portion of these particles interacts with hepatic lipase, which removes the residual triglyceride and converts the VLDL to LDL. In patients with dysbetalipoproteinemia the abnormal isoform, apo-E2, impairs the normal uptake of chylomicron and VLDL remnants. As a result of impaired hepatic uptake of the remnant particles, plasma levels of cholesterol and triglyceride increase. Generally, isolated homozygous apo-E2 causes mild remnant accumulation without hyperlipidemia. Once patients develop a second perturbation to their lipoprotein metabolism overt hyperlipidemia develops. In b-sitosterolemia and cerebrotendinous xanthomatosis there is an accumulation of sitosterols and cholestanol, respectively. In b-sitosterolemia there is a mutation in adenosine triphosphate-binding cassette (ABC) transmembrane transporters ABCG5 and ABCG8 (5). This mutation causes retention of cholesterol and plant sterols from the diet. The sitosterols reach abnormally high levels in the plasma. In cerebrotendinous xanthomatosis mutations in mitochondrial C27-steroid 26-hydrolase (CYP27A1) cause incomplete oxidation of cholesterol into bile acids in the liver. As a consequence there is an increase in the synthesis of cholestanol. 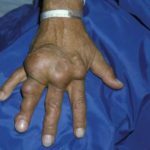 Recognition of tuberous xanthomas should first prompt the clinician to search for other cutaneous stigmata of hyperlipidemia, which could further narrow the list of probable etiologic agents. These patients should have their lipid profiles characterized as well and any abnormalities treated to slow or halt the progression of atherosclerotic disease. Patients with dysbetalipoproteinemia are at an increased risk for atherosclerotic disease of the coronary and peripheral vasculature. Identification of these patients will allow their lipid abnormalities to be treated and can improve the morbidity and mortality of their atherosclerotic disease. Patients with homozygous familial hypercholesterolemia are at a significantly elevated risk of cardiovascular disease, with most experiencing a cardiac event in childhood. As these patients lack any functioning LDL receptors, treatment of their disease can be quite complex and challenging to manage. The treatment approach to familial hypercholesterolemia is detailed in the “Tendon Xanthomas” section of this reference. Generally, tuberous xanthomas resolve in a period of months after the underlying lipid abnormality is treated. Surgical removal is reserved for the treatment of large lesions that are persistent after treatment of the primary disease process. Dietary modifications to reduce the amount of cholesterol consumed are a reasonable addition to the treatment plan of patient with a tuberous xanthoma. However, since the pathophysiology surrounds improper clearance of circulating remnant molecules the addition of a systemic treatment is necessary in a majority of cases. In addition to the above, treatment with fibric acid derivatives (gemfibrozil and fenofibrate) can be undertaken to reduce plasma triglyceride levels. These drugs are ligands for the nuclear transcription factor peroxisome proliferation-activated receptor-alpha (PPAR-a). By binding PPAR- a, they up-regulate lipoprotein lipase, apolipoproteins A-I, and A-II; and they down-regulate apolipoprotein C-III, which is an inhibitor of lipolysis. Acting on these effector molecules plasma triglyceride levels are decreased. The fibric acid derivatives exert only a modest effect on LDL and HDL. In some patients LDL levels can actually increase with fibric acid therapy and they should be monitored accordingly. The usual dose for gemfibrozil is 600mg orally once or twice daily. The dose or fenofibrate is between one to three 48 mg tablets daily. Niacin, a water-soluble B-complex vitamin, can be used to reduce cholesterol levels as well. Niacin functions to reduce the synthesis of VLDL molecules by the liver and increases the peripheral clearance of triglycerides by promoting the action of lipoprotein lipase. Two very common side effects that occur in niacin therapy and can limit patient compliance are flushing and dyspepsia. Niacin-induced flushing and pruritus, which are prostaglandin-mediated phenomena can be ameliorated by taking an aspirin each day and avoiding taking niacin with hot or alcohol-containing beverages. To avoid dyspepsia, patients should take niacin with food. Patients with a history of peptic ulcer disease should not take niacin as it can reactivate their disease. The treatment of beta-sitosterolemia is centered around limiting the amount of sitosterols that are absorbed from the diet. Limiting sitosterols and cholesterol in the diet is a good first step in therapy. But, the addition of a bile acid sequestrants or ezetemibe is often necessary. The main goal in the treatment cerebrotendinous xanthomatosis is to reduce circulating levels of cholestanol. This is attempted by modulating lipid metabolism at several different steps including ingestion of substitute lipids, statin therapy, and apheresis. Once the underlying lipid abnormality is identified and treated, tuberous xanthomas typically resolve over a period of months. Thorough recognizing this cutaneous manifestation of hyperlipidemia patients at high risk of atherosclerotic disease can be identified and treated with cholesterol lowering medications. These patients will need regular and consistent monitoring of their lipid levels and they should be managed in combination with their primary care physician and cardiologist. Very rarely, other entities have been reported to produce tuberous xanthomas: heterozygous familial hypercholesterolemia, hepatic cholestasis, and normocholesterolemic dysbetalipoproteinemia.